Before we get started, and we apologize if this is obvious, make sure you’ve communicated to your clients/members what your business hours will be starting the weekend before July 4th, or earlier. Even if you’re open at your normal hours it’s a great opportunity to send out a communication (email, text, social media) to let your clients know you’re thinking about them and want to make sure they’re informed. It’s also a great time to announce any type of promotion or activity, which, hey, is the point of this blog entry! Idea 1: Create a listing of the best places to watch fireworks in your area. Believe it or not, some of your members may not have a lot of experience in trying to find the best places to watch fireworks. Maybe you have a secret spot that you’d like to share. This can be done in a Word document and printed out for people to grab, or you can even make your own custom Google Map like this. Depending upon how many members you have, you could even plan your own fireworks-watching get-together and invite everyone. If you simply have too many members for that to be practical (and can we give you a quick 🙌 for that), consider throwing a small outdoor gathering for your staff members and their families. We agree that organizing that type of get-together could take more planning than there's time for, but don't stop reading, the ideas below are way easier to put together. We promise! Idea 2: Have a drawing and give something away. This doesn’t have to cost you much, and you should be creative. Send out an email letting your members know that anyone who comes in on a certain day or shares the post on Facebook will be entered into a giveaway that includes things like a lawn chair, 2-packs of hotdogs and buns, or a gift card to a local grocery store. We advise against giving away alcohol (too many rules and regulations to contend with) or anything flammable like, um, fireworks. Let’s keep things light and the potential for liability at zero. However, that doesn’t mean you can’t give out items that compliment that sort of adult behavior such as hangover prevention pills. Idea 3: Set up a complimentary juice and/or snack bar. Your front desk is a great place to showcase any offerings you want to ensure all clients get to take part in; such as complimentary snacks and juice. Keep it fun and festive with some all-natural juices or infused waters. Put some red, white, and blue streamers around it and you’ve got yourself an easy, inexpensive offering that shows you care about your members. Consider partnering with a local food or beverage business which will give them the opportunity to showcase their offerings while you get to offer up some tasty treats to your members. This doesn't take as much time to organize as you may think! Just ask or call around to businesses that compliment your "vibe" and see if they'd be interested in providing some treats for your celebrations. Sidenote: Don't necessarily expect this to be for free, but they may be willing to give you a nice discount in exchange for the exposure. Win-win! Idea: If your area allows for it, bring the party outside and invite passerby’s to enjoy a tasty, refreshing (and healthy) beverage. Why not also pass them a flyer about your facility and services? Idea 4: The after July 4th promotion. Most businesses don’t think about what happens after the 4th of July. We Americans take our freedom seriously and therefore like to celebrate it with good food, friends, and the occasional adult beverage. That being said, why not send out an email on July 5th that asks your members how they plan to work off those extra hotdogs and ice cold beer? Offer them a discounted class, or offer a free day pass for a friend if they come in. 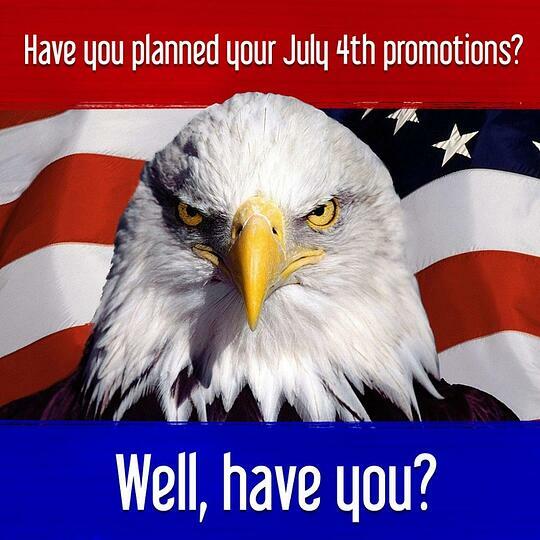 This is a great way to stand out from all the other businesses that will be focusing on pre-July 4th promotions. Hopefully this guide has helped you come up with some ways to celebrate Independence Day with your staff and members/clients. From the Club OS family to yours, we hope you have a fun, relaxing, and safe July 4th!